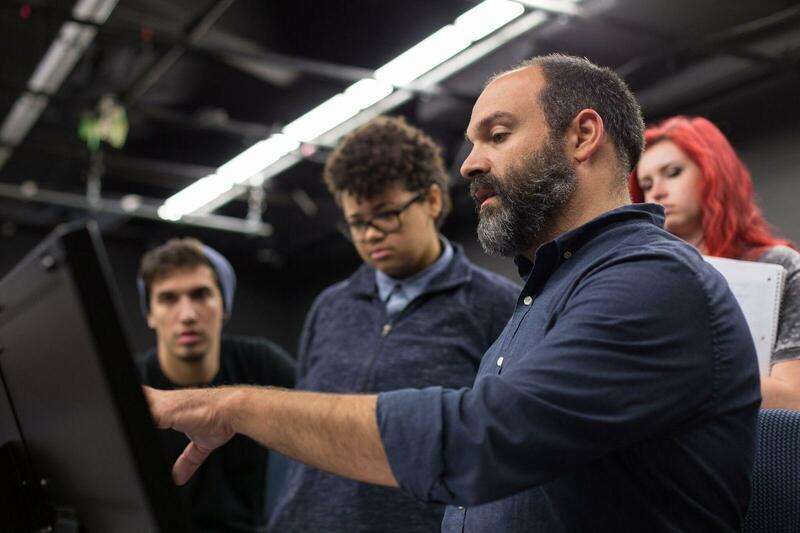 Students with a Lighting Design and Technology emphasis begin working on shows as soon as they arrive on campus, serving in roles such as Light Board Operator and/or as Assistant Lighting Designer. Students typically work on two to three shows a semester. Juniors customarily design lights for School of Music Spotlight productions or School of Theatre MainStage plays, as well as serving as Production Electrician one or two shows. Seniors commonly design lights for the School of Music MainStage Operas and Musicals, as well as continuing to serve as Production Electricians on the larger shows. By the time a student has graduated from OCU with a Lighting Design and Technology Emphasis, he/she is ready to transition easily into any role in theatrical lighting design and production. Our students routinely graduate with two or three internships under their belts. Lighting students have worked summer jobs and internships at a variety of locations, including; Glimmerglass Opera, Lyric Theatre of Oklahoma, Cirque du Soleil, Opera Saratoga, Six Flags Over Texas, Houston Shakespeare Festival, Music Theatre of Wichita, and Santa Fe Opera. These internships increase the network of contacts that our graduates need to pursue a career in the lighting design industries. The Lighting Design and Technology track curriculum encompasses a wide scope of skills and artistic explorations. Students graduate well-rounded and prepared to enter the workforce. Stage Lighting - Introduction to stage lighting equipment, techniques, practices, and safety. Lighting Lab - Companion to Stage Lighting. Hands-on experience mounting shows for School of Theatre and School of Music. Includes crewing of one show. Lighting Design - Elements of design as they apply to the use of lighting design. Includes color theory, play analysis, drafting, programming of consoles, and physics of light. CAD for Theatre - Advanced study of Vectorworks and Lightwright software, enabling students to utilize these programs to create, edit, and maintain lighting plots and various paperwork. Lighting Design II - Advanced study of lighting techniques as they apply to opera, musicals, and dance, and the history of stage lighting. Advanced Electrical Production & Programming - Study of skills/duties of Master Electrician, Production Electrician, and Lighting Supervisor. Advanced electrical theory and safety, Lightwright, programming consoles and offline editors, counterweight rigging systems, soldering, data protocols, and LED technology. Museum, Fashion, & Special Event Lighting Design - Exploration and study of non-theatrical careers in lighting. Areas include; Concerts, Restaurants, Public Art/Sculptures, Museum Exhibitions, Fashion Shows, Retail Windows, Houses of Worship, and other special events. Oklahoma Children’s Theatre- Students have the opportunity to assist and design lights in a small converted church, concentrating on story-telling without being overwhelmed by a large lighting rig. OCT productions serve as a perfect stepping-stone for freshman and sophomore lighting students. Oklahoma City Ballet- All Lighting Design students will assist the OKCB Resident Lighting Designer at least once in their time at OCU. Ballets are performed in the OKC 2,500-seat Civic Center Music Hall, affording students the chance to work in a professional venue, with a professional crew, and at a professional pace. Select students are offered the shot at touring with the Ballet. OCU Lighting Design and Technology Alumni are working all over the world in a variety of venues. Welcome to the Lighting Design and Technology Blog! My name is Megan Fouts. I am a freshman Lighting Design student from Piedmont, OK. I came to OCU without much experience in theatrical design, so pretty much everything was new to me. Due to the fact everyone is assigned to productions in their first semester, I was able to learn by observing and hands-on training though those production assignments. At OCU, you are able to observe every part of a show, from the first design meeting to strike. You are also encouraged to explore the many aspects of design. The classes at OCU are arranged so you begin taking core classes immediately. Only two of my six classes this semester were general education credits, while the remaining were design classes. The professors take the time to get to know their students individually and genuinely want you to succeed. Students continually encourage and support one another. I consider myself lucky to be part of the OCU community. I'm Bradley Taylor, and I am a senior lighting design student from Searcy, Arkansas. This past Thanksgiving, I was asked to be the assistant lighting designer for Oklahoma City Ballet’s tour of The Nutcracker to Colorado Springs. As the assistant lighting designer, I was responsible for remounting the original design of the show and maintaining the integrity of the design. This included but was not limited to focusing the show, maintaining cues, updating paperwork, and communicating with the lighting designer, who was 741 miles away. While working on the production, I also had the opportunity to build strong relationships with classmates and our professional partners from Oklahoma City Ballet during our work hours and during our downtime. We kept ourselves busy with a company Thanksgiving meal and a hike through the Garden of the Gods with the production team. In the end, I am very thankful and blessed to have had the opportunity to create many new friendships while strengthening my skills as a lighting designer. We are currently in technical rehearsals for the Puccini opera La Rondine. Senior lighting student Travis Baldwin is knocking it out of the park on this design. With one lighting plot, he has to create the looks for a drawing room that is supposed to evoke the feelings of a birdcage, a smokey Parisian night club, and a seaside cottage where the heroine walks into the ocean. Next week (Nov 17th) we are traveling to Plano, TX for the North Texas Drama Auditions. I have already looked at the resumes of all of the prospects we will meet there. Can’t wait to be impressed by the next round of OCU Stars! Bring your A-game! Students with Professor Aaron Mooney learning how to program the GrandMa2 console.